Tuesday is Market Day in Bedale and it has been for over 750 years! Why not come and experience Bedale's fine cobbled, Gerorgian-fronted market place, filled with the stalls, sounds and smells of Bedale Market. The market hosts a range of local suppliers offering fresh food, locally baked bread and cakes, household supplies, clothes, cards, crafts and other goods to attract the shopper. Bedale Market is truly at the heart of the community. Bedale market is one of the longest running markets in Yorkshire. In 1251 King Henry III granted a Market Charter to Alan, son of Brian of the Manor of Bedale to hold a market every Tuesday and a three-day fair once a year on the Feast of the Ascention (40 days after Easter Sunday). In 2006 the Market Charter was conveyed (passed on) to Bedale Town Council, which is now responsible for hosting the event each week. 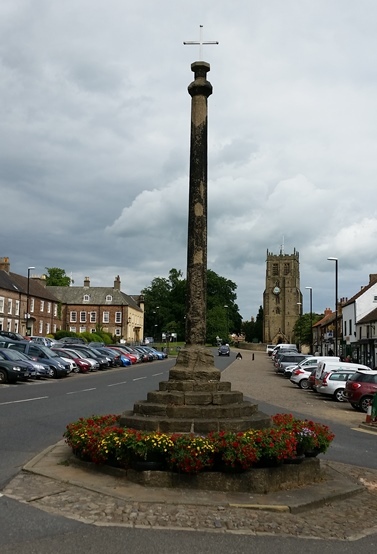 Bedale's Medieval Market Cross dates from the early 14th Century. New traders wishing to ‘stand’ on Bedale Market, either permanently or on a casual basis, should contact the Market Superintendent, via this website or on 07396 387987. The market is operated on a ‘one-line’ basis with a restriction (at the moment) on duplicate stalls, and all traders are encouraged to stand on a permanent basis - permanent traders are guaranteed a pitch in a set location and are charged discounted rents. Building on the success and history of the market in the town the Town Council organises a weekly Car Boot Sale on Bedale Park every Saturday from March to October. Special Event Markets take place at various times through the year; including a Yorkshire Day celebration in the first week of August and the Christmas Festival Market to mark the start of the Christmas Season, which in 2019 will be on Saturday 30th November.